Roy Hartsfield was a second baseman for the Boston Braves and the Toronto Blue Jays’ first ever manager. Hartsfield played for 3 seasons for the Braves (1950-52) before being traded to the Brooklyn Dodgers and sent to the minors. He then became a coach at the major league level before moving to the PCL as skipper for the Spokane Indians and Hawaii Islanders. 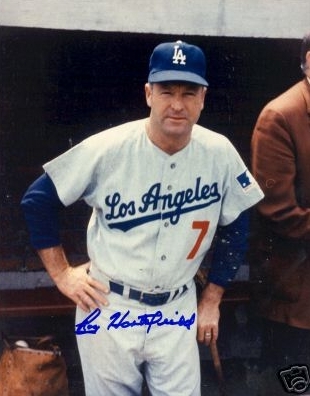 After winning consecutive division championships in the PCL, Hartsfield was offered a coaching job with the Los Angeles Dodgers in 1968. Peter Bavasi, the Blue Jays first-ever GM, hired Hartsfield after having worked with him in the Dodgers organization. Peter Bavasi has been enamoured with Hartsfield since they were together in 1965 at the Dodgers’ Texas League farm team in Albuquerque. Hartsfield was the dugout manager and Bavasi was the team’s business manager. Bavasi often listened to Hartsfield conduct dugout seminars for his players during games. 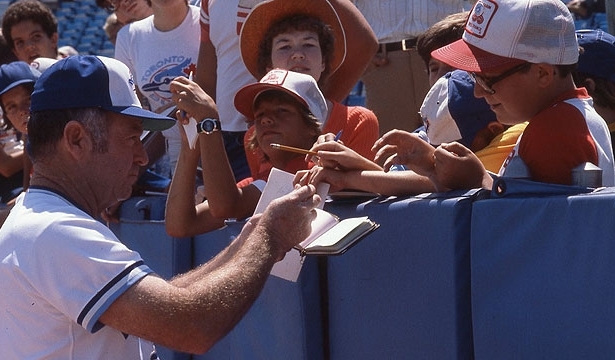 Hartsfield managed the Jays from 1977-1979, compiling a record of 166-318 (.343) in 484 games. The expansion Jays finished last in the American League East Division each season under Hartsfield’s leadership. 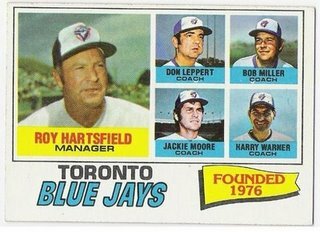 Hartsfield’s managerial career was unremarkable for the most part save for a Cito Gaston-style mutiny near the end of the season in 1979. Relief pitcher Tom Buskey stated that Roy Hartsfield should be replaced and veteran players such as Tom Underwood, Roy Howell and Rick Bosetti agreed. They felt that Hartsfield was catering to younger players while ignoring the veterans. Ernie Whitt on the other hand complained Hartsfield saw no potential in him by splitting most of the catching duties between Alan Ashby and Rick Cerone. Hartsfield was let go at the conclusion of the 1979 season and succeeded by Bobby Mattick. The managerial career highlight for Hartsfield in an otherwise dismal 3 years at the helm of the Blue Jays was being named to the coaching staff of the 1979 All-Star team. Thanks so much for posting the video its great to see the history beyond the early years of the yankees and bosox.